What do you get when you mix the band "the Streets" and design studio Troika? Guerrilla tactics...no, not what those Middle Eastern radicals are doing to each other, but guerrilla projections. Messages written or "texted" by "the Streets" front man Mike Skinner, no not the teacher from "The Simpsons", that guy with the accent that does that UK rap thing. Yeah, that's him. 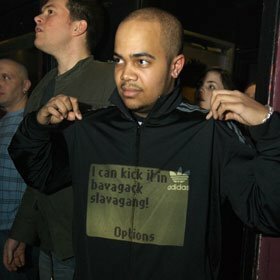 These messages get projected by a "light gun" from well hidden crew members that move around the venue, keeping people guessing about the messages' source. Although Mike Skinner is probably not the best person to go to to have your copy checked, it suits the band. A concept watch submitted by Paul Bosveld for the Red-Dot awards. He calls it "touching time". No more rudely interrupting conversation to check the time. 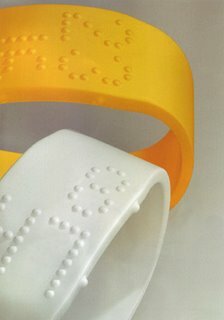 This watch has Braille like numbers that are easily read with a finger or visually. Still in concept phase, but it made my heart smile (thanks Oprah) for a few seconds. 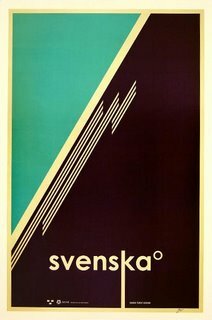 Affordable yet desirable. Childlike yet sophisticated. 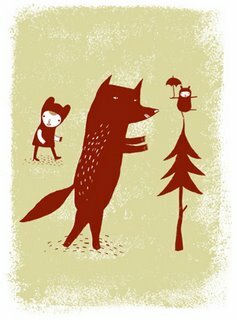 This Swedish born (Camilla Engman) artist has a youthful, playful, child-like style that uses simple colour shapes and drawings. Great for living rooms or to add to a theme in a kiddies room. They would appeal to any fan of nostalgia and give them that soft warm gooey feeling inside...Or maybe that was the old cereal I had this morning. Either way it's not that bad. South African architecture is starting to stand out as a definitive forward moving style in the view of architectural circles. This purist approach can be extracted when viewing the Constitutional Court in Johannesburg. A collaborative model was formed with the likes of Andrew Makin and his Design Workshop team and Garth Walker of Orange Juice Design. Both companies hailing from the coastal town of Durban, they were briefed with the following requirements, accessibility, transparency, identity, diversity and legibility. Screens and filters were used to enhance light, while the structure itself references the future, while remembering the past. Visi is a South African magazine which is published monthly. I have nothing to add about this magazine because its perfect. Go buy it. That's an order. ISO50. An online sensory experience. Soft melodic tunes creep through your headphones as you view Scott Hansen's portfolio. DJ, designer and artist, Scott is a Californian based artist who has worked for the likes of K2 snowboards and Frisbee. Amazingly refreshing, treat yourself. Trends often take time to gain momentum. This one in particular took a decade to develop. It's called Clearview. 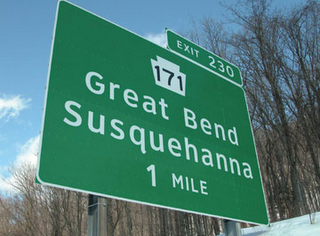 No, not another bottled water product but a new font appearing on road signs in the United States. Created purely for increased legibility and to reduce the effects of overglow on high brightness backgrounds. Typographer James Montalbano worked on a sans serif font to include six different weights, each having a version for positive or negative contrast applications. It has proved readable from 900 feet away, and the use of mixed case in lieu of all capital letters increases recognition 14 to 29 percent among older drivers at night, depending on the size of the type. The font has been approved by the U.S. Department of Transportation and will be implemented soon. 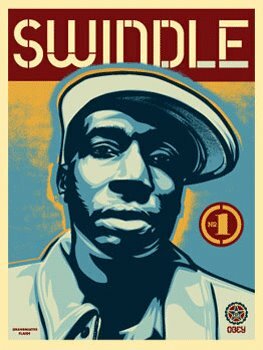 Swindle is a quartely magazine that defines popular culture and lifestyle. This publication is for both women and men of ages 18 to 34. It offers the reader an intelligent yet whimsical appraoch to modern culture without being put into the "trendy" bin. Swindle is designed by Studio Number One, which more recently produced the "Walk the Line" poster for the Johnny Cash Universal Pictures release. 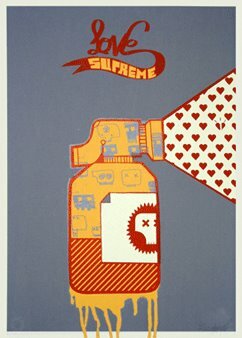 You can order issues 1-4 through www.obeygiant.com, as well as getting Issue 1 signed by the creators. It goes for about R150. Good value for your pennies you earned. ...aaah, go on, treat yourself. 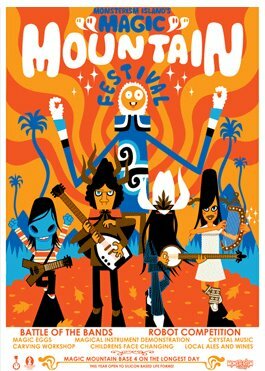 Posters I discovered while researching Jamie Hewlett, "Love Supreme" by sickboy and "Magic Mountain festival" by Pete Fowler. You can veiw and purchase these prints at pictures on walls. 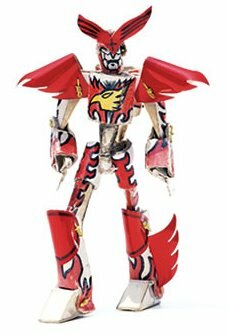 Since 1982, over 200 Kami-Robo have been created by Tomohiro Yasui. Madroneck Fighter, the first Kami-Robo, remains in top condition and is a keen contender in the ring. Every Kami-Robo has a name and a well-defined personality. As they battle, friendships and alliances are formed and broken. 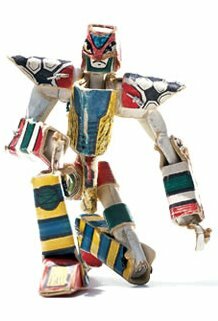 Kami-Robo are robot fighters made from paper, measuring about 15 to 20 centimeters tall. They have joints at the shoulders, hips, elbows, knees, wrists and ankles, which enable them to move freely and smoothly. They are designed to fight. 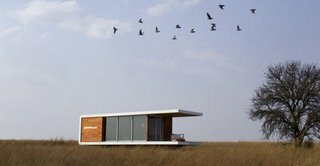 Winner of the Design Museum's R270 000 Designer of the Year award. Jamie Hewlett, co-creator of the band Gorillaz, for conceiving the graphics, website, animations and groundbreaking "live" virtual performances. Born in 1968, Hewlett designed comic book anti-heroine Tank Girl before creating Gorillaz with musician Damon Albarn. 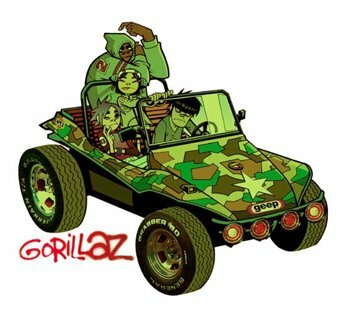 The band members - 2D, Murdoc, Russel and Noodle - are brought to life in artwork, promos, the website and animated performances conceived and designed by Hewlett. Hewlett works from his West London-based design company Zombie Flesh Eaters. Meet the Dunny. Yes, he is smooth, cool and made from vinyl. He/she rules the toy vinyl kingdom with style, class and attitude. Dunny was the brainchild of Kidrobot designer Tristan Eaton and owner Paul Budnitz. 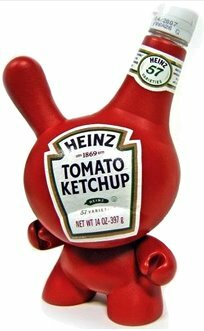 It was created to be a customized toy that could have any design applied to Dunny's smooth exterior. Designers like Gary Baseman and Pete Fowler have all had a hand in the creation of personalised Dunnys. Highly collectible and sought after, Dunny Series 3 is about to hit the stores, be sure to get yours. You "Gotta catch 'em all!" "The Face" magazine was always a great favourite of mine for influential current lifestyle and culture information. Although not being old enough in the 80's to realise the full potential of the magazine, I was hooked the day I bought my first copy at the local newsagent. "The Face" was started in 1980 by a well known Britain by the name of Nick Logan. This fashion/music/lifestyle/culture and everything else inbetween magazine was often referred to as the "80's fashion bible". It reached its peak of success in the mid-90's with issues such as the Kate Moss article. Unfortunately all empires must come to an end at some point in their lives and due to declining sales and a flooded marketplace it closed down in May 2004. I cling to my issues like gold and perhaps they just might become a little valuable in the not to distant future. Kidrobot, along with Gorillaz and illustration-master Jamie Hewlett have produced these oversized Vinyl figures of the platinum-selling animated pop band. Released to coincide with the Gorillaz second album, Demon Days, these are the most beautiful figures they've ever produced. They have the whole crew: Noodle, 2d, Murdoc, and Russel. Giant-sized, too -- 2D stands almost 13 inches tall. Noodle includes an accessory guitar, and all toys come with a sheet of plastic stickers. 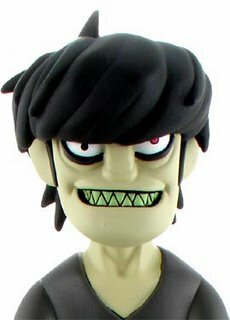 These are the only authorized Gorillaz toys ever made, produced in limited edition with the full cooperation of Jamie and the Gorillaz crew. Uber-limited! Zenkaya is all about convenience; from the moment you order it to when you live in it. It is a fusion of modern technology and practicality which will give you peace of mind. It is delivered completed, ready to live in, to your site right on the back of a flat bed truck. ZENKAYA, for your peace of mind.